Achieve professional painting results with Columbia Paint! Are you going to try your hand at interior painting? It is important to remember that using proper techniques is the only way to achieve professional looking results. 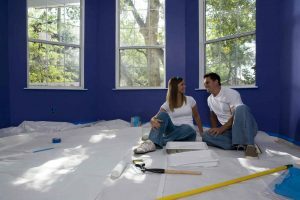 If you are one of the many who is lacking confidence when it comes to painting, you have come to the right place. Read on to learn about some of the best interior painting techniques. Many people struggle to use paint brushes because they hold them incorrectly. When handling a paint brush, you want to grasp it near the bottom of the handle. When you are applying paint to the brush, dip half of the bristles into the paint can and tap on the side of the can to remove the excess paint. You don’t want to wipe the excess paint on the side of the can or the container. It is also important to remember that you never want to apply a lot of pressure to the brush. The bristles should only bend slightly. For the best painting results possible always make sure that the roller is evenly coated with paint before you apply it to the wall. After you place the roller in the tray, roll it back and forth slowly. You can use the tray edges to get rid of any excess paint. A paint sprayer can be a little intimidating if you have used one before. Using a paint sprayer take a little practice. For this reason, you should try to get the proper technique down on before you start your painting project. Get yourself a piece of cardboard and practice on that. When using a sprayer, you always want to keep the nozzle perpendicular to the surface when you are moving it back and forth. Also, try to keep the nozzle approximately 10 inches away from the wall. You don’t want to adjust the distance because this will drastically affect the amount of paint that will get onto the wall.